Important: These are not plans for making this yourself. These are the directions that came with this trick when it was on the market for $195.00. This PDF is designed for collectors who may have the prop, but no directions, magic historians, and those simply curious as to how this trick was done. The trick still shows up on eBay, magic flea markets and auctions. If you need the directions, then here they are. 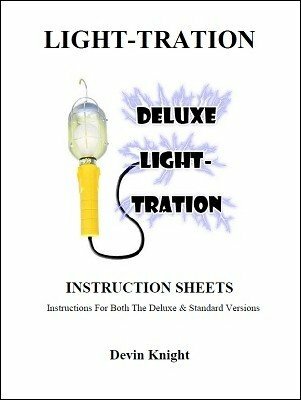 Light-tration was available in both a standard and deluxe form. These instruction sheets include directions for both models. Magician introduces a trouble light with an 15ft Electrical cord, the kind used to work on cars. He invites two people up casually examine the cord. THE SPECTATORS plug up the lamp and THEY TURN IT ON. The magician need never touch the actual light switch. The spectators stretch the cord between them with the light still burning...magician says "When I work on my car I always get tangled up in these cords, not anymore!" He reaches behind him grabs the cord and visibly pulls it thru his body...THE LIGHT REMAINING ON AT ALL TIMES. Add a FunkenRing (not included) and sparks will fly as it goes thru your body. This effect is now being used by professionals around the world. An effect that is different and light years ahead of rope thru body. Doesn't have to be an opener. Do anytime during your show; do it surrounded. No fumbling, clean and fast. Show your hands completely empty before the trick begins. After you magically pass thru the light bulb is still burning! It never goes out during the whole trick. Baffling beyond words!